Generation Kenya's Kartik Jayaram and Mehdi Sinaceur recently published an op-ed in The Standard. It is estimated that there more than 75 million young people who are unemployed worldwide, yet many organisations struggle to find potential employees with the skills needed for entry level jobs. Globally and locally, there exists a manifest mismatch between graduates from learning institutions and the human resource needs in the real economy. Jemima, a single mother struggling to make ends meet despite having completed her high school education, aptly personifies this challenge. Jemima is one of the more than 800,000 young Kenyans who enter the job market every year after completing primary, secondary school or higher learning. Now more than ever, there is need for constant training and education that prepares young people for employment by making them more equipped to face challenges associated with the demand and supply disconnect of the skilled workforce. A report commissioned by the World Bank spotlights the way in which attempts to close the skills gap are currently bogged down by lack of business experience on the part of the trainers and inadequate training curricula which lack sufficient integration with the formal Technical and Vocational Education and Training (TVET) system. Human development is indispensable in any country’s quest for economic development; this is even more so at a time when the Government seeks to raise the share of manufacturing sector from nine to 15 percent of the gross domestic product (GDP) by 2022, expand food production and supply, provide universal health coverage for all Kenyan homes and build 500,000 affordable houses. To raise labor participation for unemployed youth like Jemima in the Government big-four agenda, the Government in collaboration with other stakeholders will need to employ a model that is defined by dynamic measurement of supply and demand, with economic rewards being inescapably linked to value addition. All stakeholders will need to be more innovative in the approach to this problem in order to be successful. There is a need for TVETs to adapt rapidly to the Government’s agenda as well as have a paradigm shift in their curricula to focus more on jobs and measure TVETs performance based more on job placement, rather than the number of students trained. As this happens more efforts also need to be put towards sustained campaigns to change social perceptions of vocational education from seeing it as a last-resort education option to seeing the TVET approach as monumental to the country as far as youth employability and sustainable enterprise development is concerned. This effort to improve vocational education’s attractiveness would attract more stakeholders to put their innovations and best practices in place towards increased impact in skills training and low unemployment rates among youth. Youth labor participation is integral to the Government’s ambitious plans, in view of the fact that the government plans to create 1.3 million manufacturing jobs by 2022. To realise the Government’s big-four agenda, TVETs and other stakeholders need to work closely together towards increasing the pool of skilled workers in industries in Kenya, as well as create opportunities for the utilisation of the skilled labour for improved productivity. Such opportunities could include: building an agent workforce for health insurance and pool of innovative and highly skilled talent who would boost innovative scientific advances towards affordable healthcare; coordination with the Ministry of Trade and Industry to embed trained workforce as an incentive to manufacturing companies they seek to attract; encouraging participation of industry practitioners in training delivery to ensure quality improvement and a keeping up with the fast changing technological changes in the industries; integrating green skills into vocational training and existing continuing education, which would be a step towards food security, among other opportunities. New technologies have disrupted established business systems, potentially rendering redundant a myriad of traditional jobs. We are on the verge of a swift transition to fragmented division of labor that will assign highly specialised tasks to people at the point of need. According to the World Economic Forum Future of Jobs Report, 65 percent of children entering primary school today will ultimately end up working in completely new job types that don’t yet exist. It is currently estimated that the amount of technical information is doubling every two years; this essentially means graduates have to continually keep pace with seismic shifts in the market. However, though the world is evolving at a breakneck speed, leading educators are almost unanimous on the supremacy of several skills sets that will transcend these changes such as leadership, entrepreneurship, problem solving, digital literacy, communication, global citizenship, and team-work. Since youth make the largest unemployed age group and will face these challenges throughout their careers, there needs to be a focus on programs that connect young people like Jemima with a pathway to skills and entry-level employment and that focus on demand-driven skills, integrating the most important behavioural and mindset components. But to be sustainable, these programs not only need to create value for their young participants, but also for employers–through a reduction in required interview hours, better trained professionals, increased individual employee performance, and employees who stay on the job longer. This mutually beneficial engagement allows companies to be more agile and efficient, while raising youth labor participation. One example of such a program is Generation, a global youth employment nonprofit that operates here in Kenya. Working with employers directly can change outcomes. Generation evaluates the local labor market to identify entry-level jobs that feature either high scarcity or high turnover. Based on this, short, intensive programs (4 to 8 weeks long) are developed that train participants in specific technical and behavioral skills and provide support services to help them be successful, with a goal of connecting young people to the skills that will enable them to not only find entry-level jobs, but start a career. This program targets disadvantaged youth like Jemima who are between 18-35 years and who have been disconnected from the job market by challenges ranging from a lack of skills and sufficient qualification to long-term unemployment, among others. To date close to 8,000 young people aged between 18-35 years have completed the program and 83 percent of them are employed within three months of graduation. Jemima, who we mentioned before, joined Generation Kenya, and the skills she acquired landed her a job at Dichotomy, a retail and fashion store. She says she now is able to meet her basic needs and those of her son. 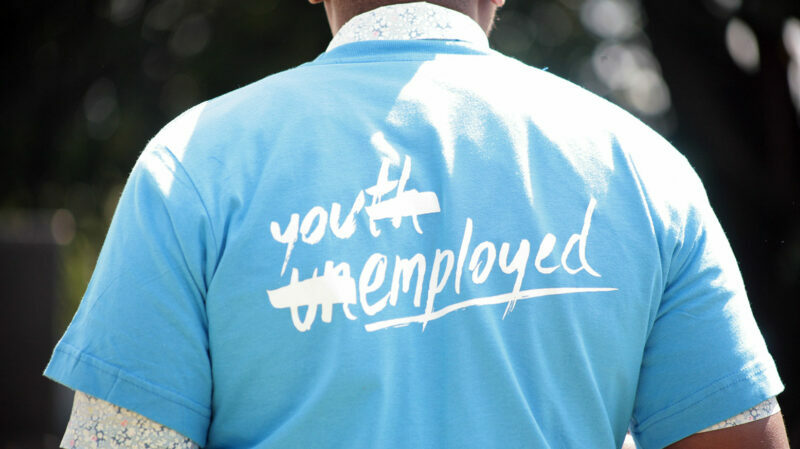 Tackling youth unemployment by bridging the gap between youth and job opportunities will thus need a new approach that brings together youth, employers, government and practical training programs. This model will provide young people with tools, training, and mentorship needed to make a living in a fast-changing work environment and will create value for employers: a winning proposal for all involved.